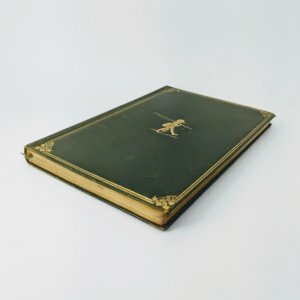 Now We Are Six By A A Milne First edition, first Impression of the deluxe edition, bound in green leather (Methuen 1927). 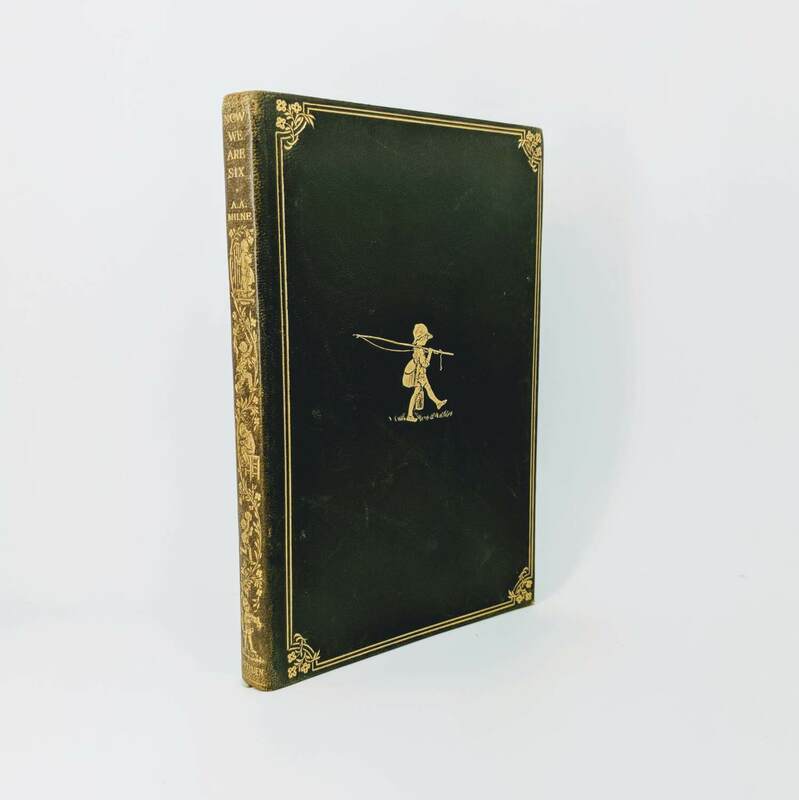 Black & white illustrations and decorations by E.H. Shepard, pictorial endpapers, ink gift inscription to front endpaper (dated 1928), green silk ribbon marker, all edges gilt, original green limp leather gilt, rubbed and marked, spine slightly faded. The Christopher Robin Story Book By A. 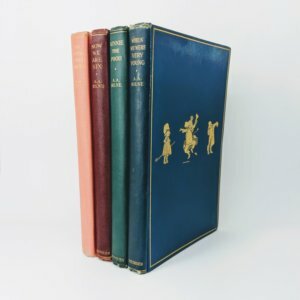 A. Milne First edition, first impression (Methuen & Co, 1929). 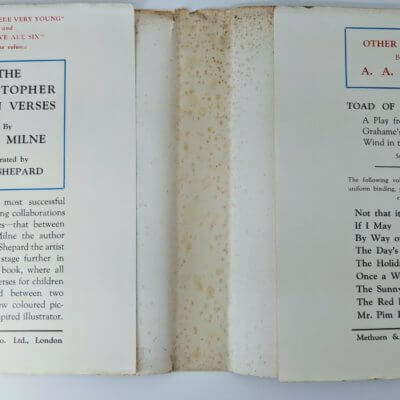 A compilation of verses taken from 'When We Were Very Young' and Now We Are Six' and stories from 'Winnie the Pooh' and 'The House at Pooh Corner'. Minor bumping to head of spine and to top corners of upper and lower boards; some foxing to fore-edge and foot of text block. Free from inscriptions and contents clean. The original dust jacket is excellent and still very clean and bright. There is some wear to extremities; minimal toning to spine panel; a very small amount of loss to spine foot with some chipping to corners; a couple of very small closed tears to rear panel. A great example and rare in this condition. The Christopher Robin Verses By A. 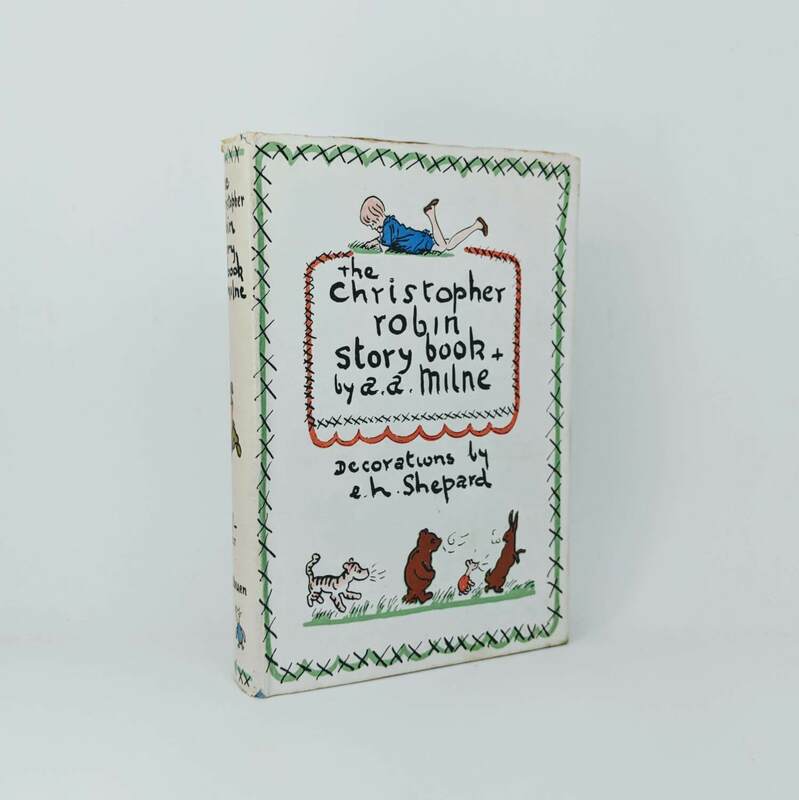 A. Milne First edition, first impression (Methuen & Co, 1932). 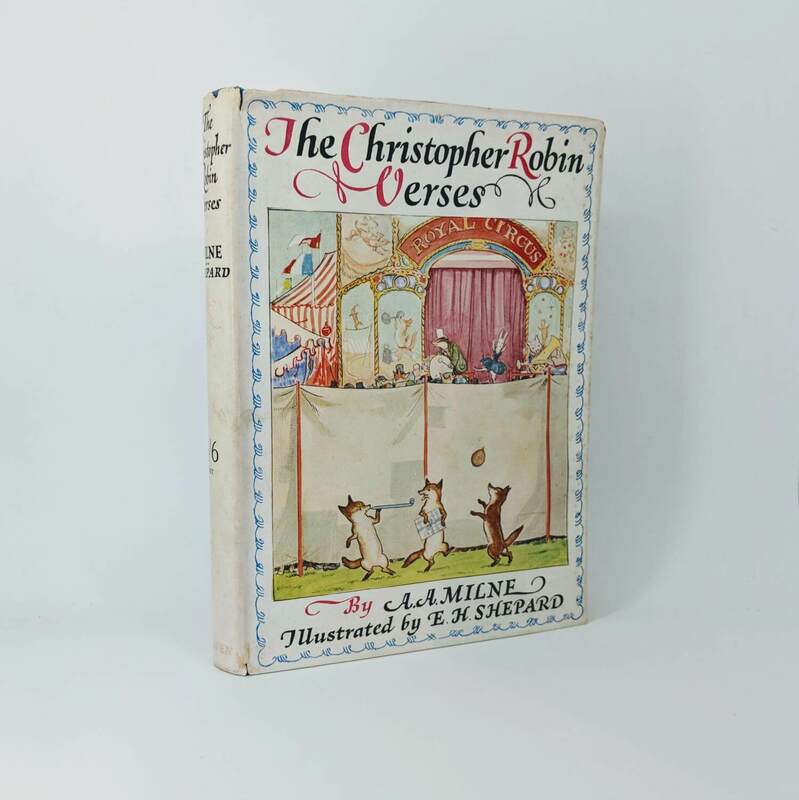 Featuring beautiful colour illustrations by E. H. Shepard. Covers slightly bowed; compression to spine foot; offsetting to front and rear endpapers with light foxing to fore-edge and foot of text block. Dust jacket spine panel has some light toning and fading to lettering; edge wear with a couple of small chips to corners; minor spotting/soiling to rear panel; closed tear to top edge of front panel with some foxing to verso. A very good example. 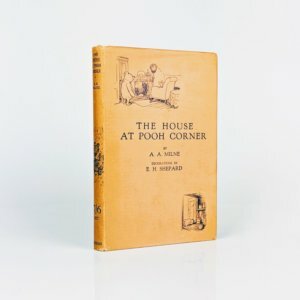 The House At Pooh Corner By A.A. Milne First edition, first impression (Methuen & Co, 1928). Featuring the first appearance of 'Tigger'. Some discolouration to bottom corner of upper board and lower board; a little inconspicuous staining to bottom edge of preliminaries with evidence of some sticky residue to bottom corner of front endpaper - very good. Original dust jacket has just a little rubbing and very minor chipping to spine tips and top fore-edge; slight toning to spine panel - near fine. An excellent and bright example. 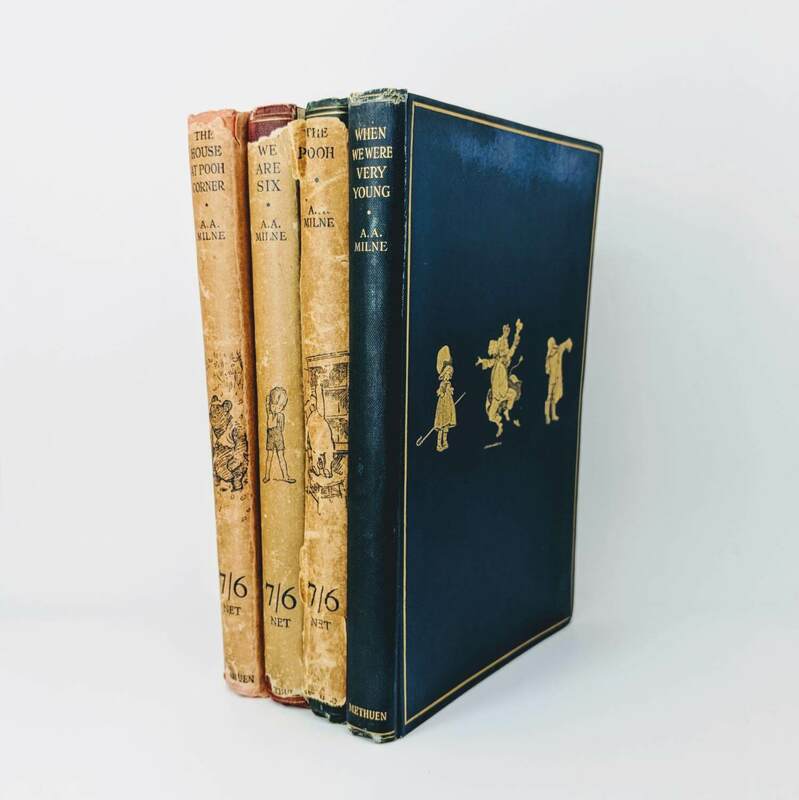 A complete set of first editions and first impressions, all in original and unclipped dust jackets except for 'When We Were Very Young'. When We Were Very Young - First Edition, First Impression (Methuen & Co, 1924) First state with 'ix' absent from contents leaf. Spine ends a little bumped & rubbed; corners rubbed; some discolouration to top edge of upper and lower boards; gift inscription to front paste-down dated '1925'; some off-setting and light foxing to endpapers and paste-downs. Nice and tightly bound and contents still lovely and clean. No dust jacket. 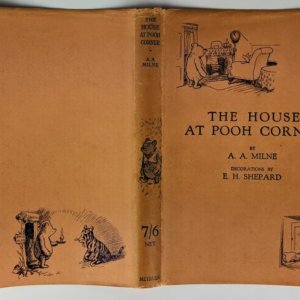 Winnie the Pooh - First Edition, First Impression (Methuen & Co, 1926) Damp staining to bottom edges of boards; spine tips and corners bumped; joints beginning to feel a little loose; gift inscription in pencil to front endpaper dated '1926'; some foxing to edges, especially to final pages. Unclipped dust jacket has '117th thousand' to rear flap; a little water damage to upper and lower panels; corners chipped with some loss to spine tips; rear panel completely separated from spine hinge. Now We Are Six - First Edition, First Impression (Methuen & Co, 1927) Spine tips and corners a little rubbed/bumped; slight off-setting to half-title and to rear fly-leaf. Foxing to edges. Free from inscriptions and tightly bound with contents still nice and clean. Dust jacket has some loss to spine tips and to upper panel; spine panel toned; a few small tears to edges. Upper and lower panels bright and clean with one or two spots of foxing to lower panel. 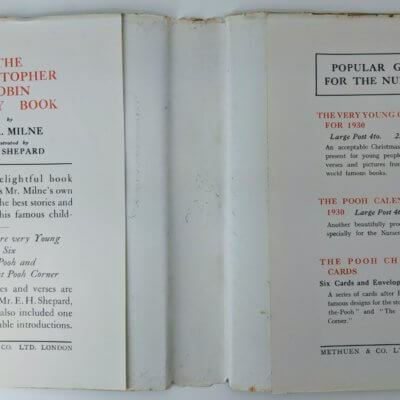 The House At Pooh Corner - First Edition, First Impression (Methuen & Co, 1928) Some bumping to spine tips and to top corner of upper board; off-setting to front and rear endpapers; chip to edge rear endpaper; some foxing to edges; very small tear to edge of frontispiece. Dust jacket has some loss to spine tips and to top edge of lower panel; corners chipped with a few small nicks to edges.